Recently I came upon Padlet and as I explored the service it grew on me. Their big idea is a collaborative link sharing service with an attractive presentation. What really sold me though was their breadth of privacy options. Often one has to choose between private - selecting individual users, and public - everyone. 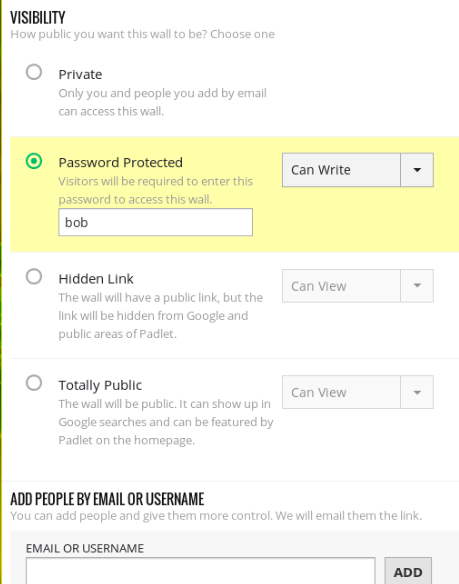 What I liked about Padlet was different access levels depending on the particular Padlet. The initial problem with a service like this is in a 1-1 classroom or a staff meeting is not all users may have access or be logged into their Gmail for the private option. With this in mind I love the ability of securing a hidden link with the extra security of a password. Students or staff could just go to the link and put in the password for write access. For me, this is great digital substitute for those post it posters that are so popular in staff meetings. In addition, in a classroom setting it could be great for classroom reflection or questions. Padlet has also done a nice job on the export options. A finished Padlet could be exported to an image, PDF, or spread sheet. The Padlet can be a take away from the activity or staff meeting.